We have recently created a Chrome App for Matthews Training. Matthews Training is a course provider for the API Exams. The API exams are taken by engineering inspectors working in the petroleum industry. Recently the API exam provider had moved from paper to computer based exams. The team at Matthews training wanted to send their course delegates into the exams feeling confident about the use of this new technology on exam day. So our brief was to create a computer based mock exam to be used as part of the Matthews Training API training courses. We decided that the best way to do this was to build a Chrome app. As user friendliness is the biggest priority the Chrome App is has been designed with this in mind. Users take the mock exams using a Chromebook which has been uploaded with the most recents update of the app. The delegate accesses the mock exam offline. This was crucial to ensure that candidates could not access any online resources during that timeframe. The delegate may access any relevant documents used in the exam by using the built in pdf viewer. Therefore each delegate has an authentic API exam experience. 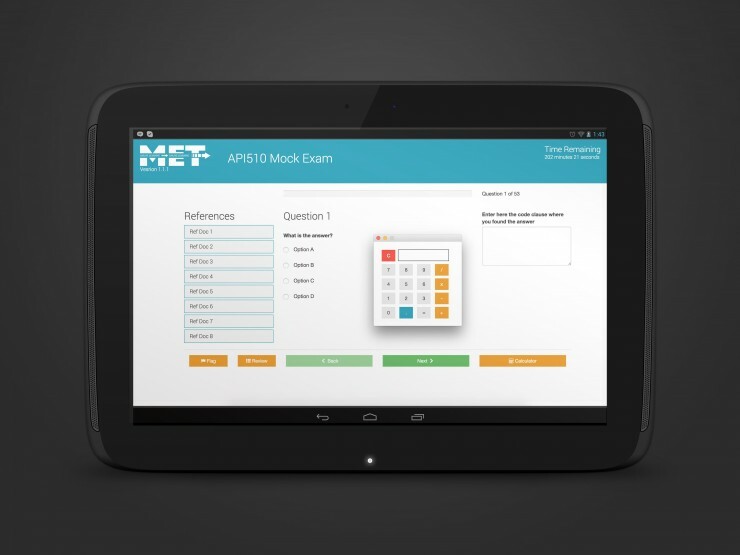 The Mock Exam App is very easy to update with improvements by uploading updates app via the Chrome App store. The Chome books are then connected to the store and the updates come through in minutes. We have developed two different mock exams within the app and are in the process of creating a third. Feedback, from candidates on training days, has been very positive. Candidates have said that the app is very easy to use and navigated. Hence we are proud to say that the mock exams have been a success with the majority of the candidates going on to pass their exams. As a result the Chrome App has helped trainees to enter the API exam with confidence. Matthews Training are delighted with the application, due to its ease of use, simplistic design and quality of finish.